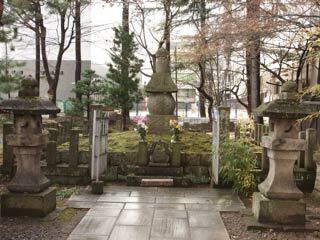 The grave of Gamoh Ujisato (蒲生氏郷の墓）is located in Kotokuji Temple in Aizu-Wakamatsu. Gamoh was one of Christian Daimyo during Sengoku Period. He is one of the founders of Aizu-Wakamatsu. He name this area Wakamatsu after his homeland. Tsuruga Castle was also built by him, and he named Tsuruga after his name of boyhood. at the back side of the temple, there is a gate for his grave. He was born in 1556, and became Samurai of Odanobunaga later. Nobunaga loved his combat skill and let Gamoh married his daughter. He was welcomed as Oda family. He was great warrior and joined many battles such as Anekawa and Nagashino. When Nobunaga was killed, he served Hideyoshi. Under Hideyoshi, he made many great victories again, and became the lord of Aizu in 1590. He renamed the town name to Wakamatsu and built Tsuruga Castle. As the lord of Aizu, he contributed economic growth of Aizu.